CAMBRIDGE, Mass. — The controversy over protests during the national anthem at NFL games last season helped propel issues of racial inequality and social injustice to the forefront and gave athletes a stronger voice to bring about change, current and former players said Friday. 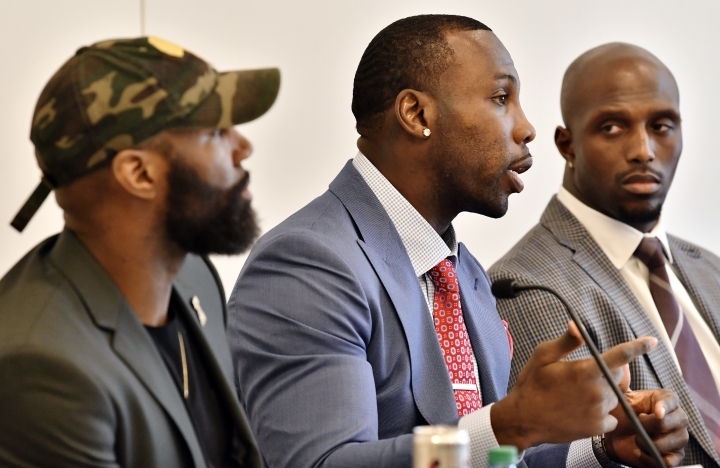 The players, who spoke at Harvard Law School summit on criminal justice reform, said they capitalized on the attention surrounding the protests to highlight issues they care about, like mass incarceration. Now, they're using their platform to talk to lawmakers, police chiefs and prosecutors across the country about injustices they see in the communities where they grew up. "With all of the controversy and the fanfare around (the protests), it created a platform that was probably larger than any of us would have had individually, and we were able to leverage that," said Malcolm Jenkins, a safety on the Philadelphia Eagles and co-founder of the Players Coalition, a group of NFL athletes advocating for policies to further social and racial equality. Colin Kaepernick started the NFL anthem movement when he was with the San Francisco 49ers in 2016 to protest racial inequality and police brutality. Some players knelt during the anthem, an act that drew the ire of Republican President Donald Trump, who called for NFL owners to fire such players. In response to the player demonstrations, the NFL agreed to commit $90 million over the next seven years to social justice causes in a plan that involves league players. New England Patriot Devin McCourty said in an interview with The Associated Press that the NFL's support of the players' mission has been encouraging. "I think the NFL has seen the bigger picture — that this is not just the players trying to do something to give back — but these are real issues that not just the players should care about but we should all care about," said McCourty, who spent Thursday at the Massachusetts statehouse lobbying lawmakers on juvenile justice issues. The athletes were joined at the Harvard summit by Philadelphia District Attorney Larry Krasner and other lawyers as well as professors, judges and activists. The players participated in small group discussions about policing, prosecutors and sentencing reform. During a panel discussion led by The New York Times Magazine's Emily Bazelon, the players discussed personal experiences — like watching videos of police shootings of black men or hearing the stories of their own family members — that drove them into activism. They spoke of the need for police to have stronger relationships with people in their communities and the importance of having real conversations about race, even when it makes people uncomfortable. "We have the unique ability to bring people to the table and now we have the responsibility when we have everyone at the table to speak truth and kind of force that conversation," Jenkins said. The players said some athletes worry that getting involved in social or political issues will hurt their careers. But they said they hope that lending their voices to these causes will inspire others to take action. "A lot of people just think about athletes as just jocks, but there are some brilliant minds in those locker rooms," said Anquan Boldin, a former Baltimore Raven. This story has been corrected to reflect that Jenkins' first name is Malcolm not Malcom.